Our team of advisors will be here to help from 9.00am – 5.00pm, Monday to Friday. Our phone lines are closed over the weekend. To save you time contacting us, we've summarised the most common enquiries with the answers below, just click on the heading that is most relevant to you and read through the information. We hope this will answer your query, however if you still require assistance our contact information for Customer Services will also be provided. Please have any relevant information and your credit/debit card details to hand if you call. PLEASE NOTE THAT WE WOULD PREFER THAT YOU MESSAGE US AS WE WILL THEN BE ABLE TO CARRY OUT ANY NECESSARY RESEARCH AND REPLY TO YOU. If you message us below please include your Phone Number so we can contact you. If you are an international customer please open an account as normal by clicking here. Please ensure that you accurately choose the delivery country and address. Please then select all the products that you would like to purchase and add them into your basket. At the checkout stage, when you are signed in there is a "Send Request" button. We will then calculate the shipping and send you an email which will offer you the choice of paying by Paypal or Card. After clicking one of those payment options in the email you will then be directed to a secure page to make your payment and complete your order. If you would like to ask us any further questions, please fill in the boxes below and we will respond to your email. If you want to check the stock of an item please enter the product ref (6 digit number) into the box below. This is next to every product on the website. If you are looking at a page with a drop down then the product ref will be indictated in the second drop down once a selection is made. The system will give you an automatic up-to-date stock situation. We will then follow that up with an email shortly later where one of our customer service team will confirm the stock level. Please note it is very rare that the systems stock is incorrect. If you would like us to contact you regarding this product, please enter your email address and optional phone number. One of our sales staff will then contact you. If you have a general question or a query about a specific product then please fill in the box below and we will promptly reply to your question. Please include as much information in your question as possible and include the product ref if you are asking a question about a specific product. Please visit the Technical Tom page to ask us any techical query. We get asked a huge number of technical questions and Technical Tom does publish them on that page once answered. Please check that your question has not already been answered before contacting us. Your Parcel has not arrived as expected. Please add your order number in the boxes below and an up to date email will be sent to your email address. If you do not know your order number please enter your registered email address and details of the latest order that you have placed will be sent to you. You may cancel your order at anytime up to when we have despatched the item(s) to you. If you want to cancel, please add your order number and registered email address in the boxes below and click "Cancel Order". You will then be given instant confirmation with a cancellation reference. Please fill in any TWO of the options below. Please enter your order number plus your requirements into the box below and click "Change Order". One of our customer service staff will then call you to confirm the change. If you have a preferred phone number please include it in the message. Please include any relevant Product Ref's in the message. Fill out your Order Number OR Email and Postcode in the boxes below, together with a reason and we will generate a returns code that you write on the returns slip and include it in the returned package. PLEASE NOTE THAT WITHOUT THE RETURNS CODE WE WILL BE UNABLE TO PROCESS THE RETURN. THIS IS GENERATED BELOW. Once you have filled in your details below and clicked "Generate Number", we will give you further instructions. We will notify you via e-mail when we have processed your return - this may take up to three weeks. We can organise collection of some larger items and the price will be quoted on request. Please note this in the Reason Box if you would like a quote and we will email it to you. Please give as much information as possible including the specific product ref of any problem product(s). Please provide a phone number and let us know the best time to call. We will only call if we deem it necessary. Please also include the product ref of the problem item(s) and as much relevant information as to what the fault/problem is. If the item is technical and you have fitted it your caravan/motorhome please include the Make, Model & Chassis Number as we will be unable to continue without this information. If you take delivery of an Leisureshopdirect.com package and the contents have been damaged in transit, you will need to report the damage to us within 24-48 hours of receipt of the item. Please fill in the details above and tick the damaged/faulty checkbox. Please provide a contact phone number and the best time to call and one of our customer service staff will phone you and discuss the return with you. If you decide to send the package back yourself your return postage costs will be refunded but only to a maximum value of the original postage on your order. You have the right to return a faulty item to Leisureshopdirect. Please keep all the warranty information that accompanies your item as this will be needed should there be a fault. In the unlikely event that you have a faulty item, you may find it quicker and easier to contact the manufacturer directly so that they can rectify the problem for you. Please fill in the details above and tick the damaged/faulty checkbox. Please provide a contact phone number and the best time to call and one of our customer service staff will phone you and discuss the return with you. As soon as you find out we've sent you an incorrect item, please fill in the details above. We will then contact you to arrange the return. You will not be charged for return postage. Items ordered incorrectly by the customer can be returned at the customers cost. Once received in original condition (with any seals and shrink wrap intact) the full cost of the product(s) will be refunded back onto the customer’s card minus a handling charge of £2.50. No handling fee will be charged for damaged, faulty or items received which you did not order. Please note: As per Terms & Conditions - Where you have already received the goods, returning the goods to leisureshopdirect.com. together with the original invoice. Leisureshopdirect.com will refund you the purchase price of the goods minus a £2.50 handling charge. How should I send my package back? We would recommend Royal Mail First Class and obtain “proof of postage” for your records. Please contact Leisureshopdirect before returning any large or bulky items. All returned items remain the responsibility of the customer until received by us. We cannot except any responibility for goods damaged in transit which are being returned by your own arrangement. Please use the "Chat with us" at the bottom of the screen and you can talk directly to a customer service representative. If there is no "chat with us" button then that functionality is not currently available. 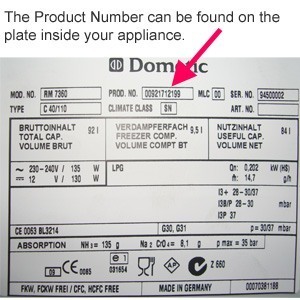 Every Dometic product has a unique product number associated to it and we will need this to identify the correct part. Each model (eg - RM8500) will have upto a 100 product numbers associated to it. Please ensure you have this number before phoning. If you have it you can enter it into the text box for quick searching to find the exact part for your appliance that you are looking for. The example below is from a fridge but this is true for Dometic, Electrolux, Smev & Cramer products. If you know your Dometic product number please type in here: Search Now Sorry, this does not exist in our system. Please can you phone us with this product number. Please note that our order-line staff are not technical. If you have a technical question, please send an email with as much detail as possible (including photos) to orders@leisureshopdirect.com. We will usually get back to you in less than one working day. In over 95% of technical phone questions, we ask for details to be emailed. In order for us to identify the correct part please fill the information in below. We will then respond to you with the part that you require usually within 1 working day. Please note that we will not be able to help over the phone without doing research into your appliance. If you require a new knob for your cooker or hob then these have a standard spindle. You need to choose your preferred design. Click HERE to visit the Spinflo page. Successfully sent. We will reply to you shortly. An error has occurred, we are sorry but please call us on 01271 862349 with the details. The email address that you have entered is invalid. Please check and try again.